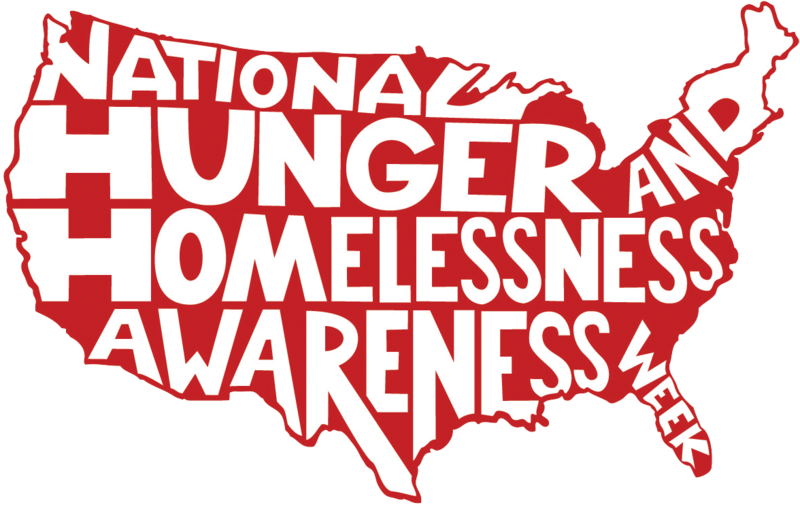 Held annually one week before Thanksgiving, National Hunger and Homelessness Awareness Week is a nationwide social movement encouraging others to show their compassion towards members of the community experiencing hunger and homelessness. 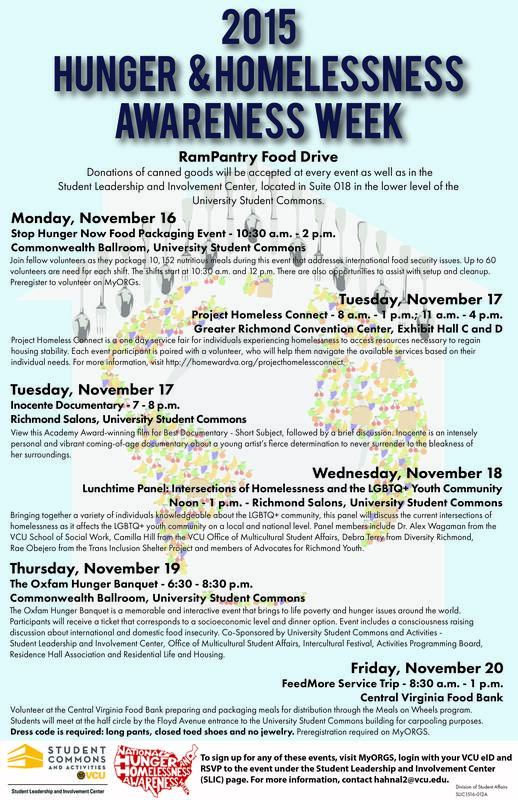 This year’s Hunger and Homelessness Awareness Week is celebrated at Virginia Commonwealth University from Nov. 16-20 through a variety of events targeted to raise awareness and support for those with food insecurity and housing instability in the local community. VCU students are encouraged to participate by volunteering, attending and promoting the following VCU sponsored events. Want to take the initiative to end hunger in your community? Stop Hunger Now is an organization which has provided over 180 million meals in 65 countries. Those interested in helping package over 10,000 meals to go abroad to families all over the world, are invited to volunteer at the Stop Hunger Now food packaging event in the Commonwealth Ballroom, Monday, Nov.16 from 10:30 a.m. – 2 p.m.
volunteer, who will help them navigate the available services based on their individual needs. Project Homelessness Connect is a great opportunity to impact those affected by homelessness in the Richmond community, as well as break down the barriers and stereotypes surrounding housing instability, a pivotal part in community unification and ending homelessness. The event takes place at the Greater Richmond Convention Center, easily accessible for both MPC and MCV students via Campus Connector. To pre-register or to learn more information, please click here. Inocente, an intensely personal and vibrant Academy Award-winning documentary, is a coming of age story about a young artist’s fierce determination to never surrender to the bleakness of her surroundings. The screening will take place on Tuesday, Nov. 17 at 7 p.m. in the Richmond Salons. The screening will be followed by a brief panel discussion. Interested in learning about the correlations between homelessness and the LGBTQ+ community? Come out to this lunchtime panel on Wednesday, Nov. 18 from 12 – 1 p.m. in the Richmond Salons. This panel brings together a variety of experts in the LGBTQ+ community to discuss the current intersections of homelessness as it as it affects the LGBTQ+ youth community on a local and national level. Panel members include Dr. Alex Wagaman from the VCU School of Social Work, Camilla Hill from the VCU Office of Multicultural Student Affairs, Debra Terry from Diversity Richmond, Rae Obejero from the Trans Inclusion Shelter Project and members of Advocates for Richmond Youth. The University Student Commons’ first annual Oxfam Hunger Banquet takes place on Nov. 19 at 6:30 p.m. in the Commonwealth Ballroom to encourage students to experience and learn about food insecurity first-hand in an interactive dinner experience. The event is co-sponsored by University Student Commons and Activities – Student Leadership and Involvement Center, Activities Programming Board, Office of Multicultural Student Affairs, Intercultural Festival, Residence Hall Association and Residential Life and Housing. The Hunger Banquet aims to portray the reality of food insecurity as it relates to socio-economic status. For the duration of the dinner, students are assigned class levels, and they eat accordingly based on their assigned socio-economic status: from a pasta dinner with fine china to a rice dinner on the floor. These assigned socio-economic statuses are not fixed for the duration of the dinner, as everyone receives a storyline as the dinner progresses, often changing their social status, to mimic real life. Volunteer at the Central Virginia Food Bank by preparing and packaging meals for distribution through the Meals on Wheels program. Students will meet outside of the University Student Commons Floyd Avenue entrance. Participating volunteers are asked to wear long pants, closed-toed shoes and no jewelry. Donations of canned goods will be accepted at every event, as well as in the Student Leadership and Involvement Center office Room 018 in the basement of the Student Commons. All donations will benefit RamPantry. For more opportunities on how to get involved, or information on how to register for any of the events above, click here.